David Weinstock makes the complex simple. His classes are fun and informative. I don’t know whether I learned more or laughed more. This essential resource is especially useful for physical therapists, chiropractors, orthopedists, and massage therapists looking for new ways to treat underlying causes of pain. Do your clients’ complaints keep recurring? Do you feel like you’re chasing the pain? Treat the cause of dysfunction, not the symptoms. 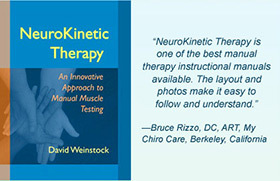 NeuroKinetic Therapy™ corrective movement system addresses the cause of pain – dysfunctional movement patterns stored in the brain. Discover why NKT® system is the missing link in your treatment protocol.